Haven't heard of Vivo before? Me neither, until I was contacted by them a month or so ago concerning their new pen brand. They offered to send me a few samples at no charge to test out, and I gladly accepted so that I could see what this line of pens was all about. Vivo is marketing itself as "Your next favorite pen", and as I mentioned in the written review to the left, I'm not quite ready to go there yet, but I think there is plenty of good to talk about with these pens. The first pen I reviewed was the Triple Gel RT 0.7mm in black ink. I like how the pen looks and feels, but it was just a bit off in the writing department. While the pen was on the page, you could make out just a little bit of ink pooling at the tip. It is not much, but what it does is make the line not as sharp as it could be, especially when compared to its obvious competitors like the Uni-Ball Signo 207 and the Pilot G-2. I have a red ink model that I need to test out to see if does the same thing. I also mentioned in the review that the barrel could use some cleaning up, but the pen has potential, and at a $1.29 each it is not going to set you back much to try it yourself. I do want to mention that the ink is considered triple safe (hence the name), meaning it is safe to use on checks, planes, and is waterproof. A very nice added bonus. The pen I enjoyed the most out of the bunch was the Vx Liquid Ink Rollerball 0.5mm micro fine in blue ink. 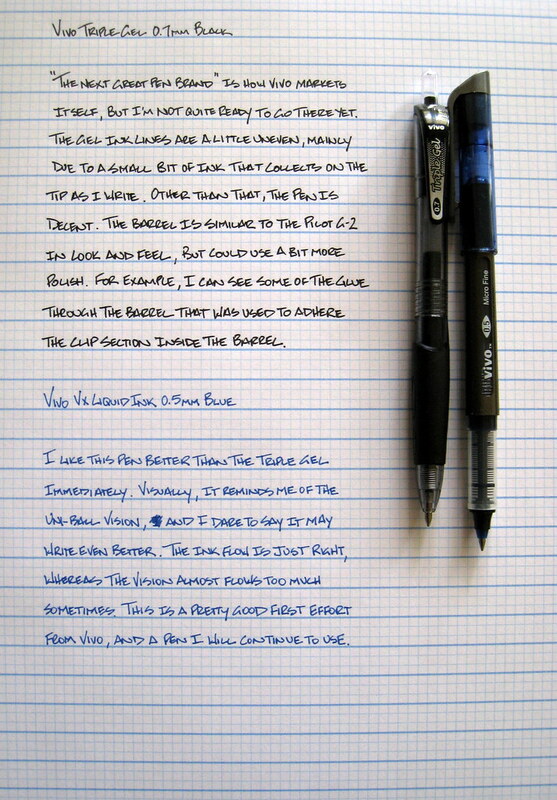 You will notice immediately how much the pen looks like the Uni-Ball Vision, and luckily it writes just like it too. The pen is very comfortable to hold, and I could just rip clean sentences off one after the other with the way this pen wrote. There is really nothing bad I can say about it, and the Vision comparison is apt. Vivo also carries a few other models - highlighters, ballpoints, pencils, and even the 1st bio-degradable correction tape - all of which can be purchased directly from their site. I have a few more of their pens to review, plus some items to giveaway, so look for both of those things coming soon. Thanks again to Vivo for providing these products for review. Posted on August 17, 2009 by Brad Dowdy.